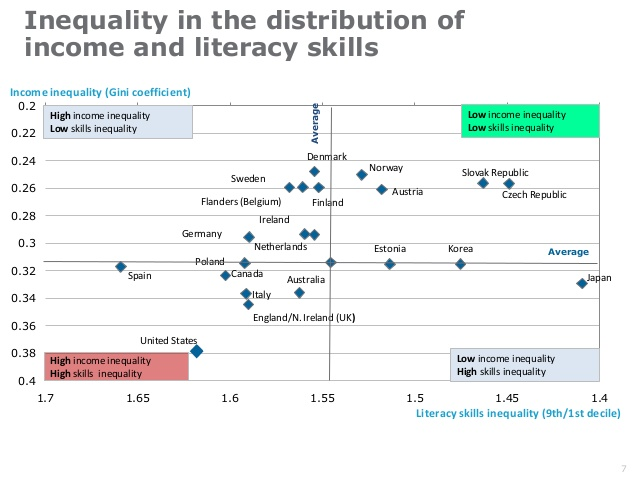 Look at where the U.S. is on this chart (bottom left): of the countries surveyed, we have the second highest income inequality, and the highest literacy skills inequality. The bottom left corner is the absolute worst place to be, and that’s where we are. But this chart also supports the notion that skills are not the only story when it comes to income inequality: Japan, which also has worse than average skills inequality, (though not as bad as the U.S.), manages to have the lowest income inequality of those countries surveyed. This suggests that other factors are at work in Japan that reduce income inequality. If skills were the only factor, you’d see the countries with the greatest skills inequality all clustered in the bottom left corner. In addition, several countries, like Germany and Sweden, do a much better job at addressing the skills gap, but still have a higher-than-average income inequality. The point is, while low skills may be an overall drag on economic growth, there appear to be other other things you can do to steer more income growth towards those at the bottom of the wage scale.